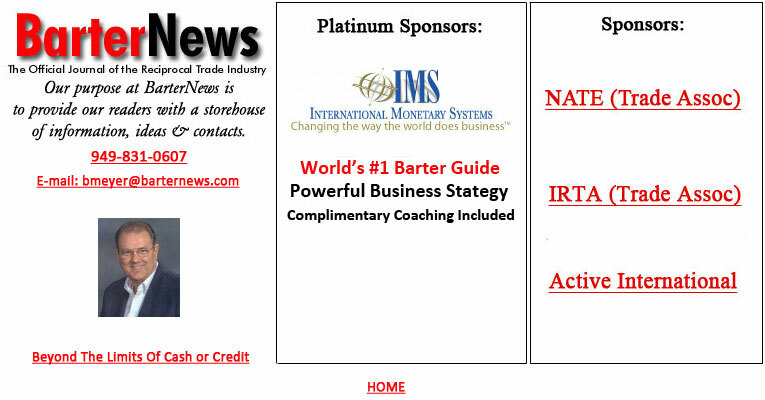 Our countertrade/offset section contains dozens of excellent articles that include a wide-degree of coverage on the many ways of countertrade--a very sophisticated way of conducting international business. An umbrella concept that has come to mean all forms of reciprocal or compensatory trade arrangements. A countertrade contract or agreement, recognized under law, is used to denote the countertrade arrangement between two or more legally competent parties in proper form, such that either party may seek legal sanctions in a court for the other's non-performance. In the countertrade context, there are three contracts involved in most transactions. The first covers the underlying business transaction; the second covers the countertrade transaction and the third covers the protocol or linkage that ties the two together. Compensatory Arrangements: Also referred to as countertrade, reciprocal trade, offset, or counter purchase. A seller of a product or system (usually a multinational, diversified or decentralized company) is compelled by the buyer (usually a foreign government) into a direct or indirect reciprocal purchasing relationship as a condition of sale. Countertrade is controversial because it is a trade management practice. However, trade management is widespread; the United Nations estimates that fully 50% of present world trade is managed trade, with countertrade accounting for half of that, or 25% of total world trade. The slow response of government and academia to the institutionalization of countertrade has left U.S. international business students and managers to learn the hard way how to use a trade management mechanism to their own advantage. American managers, most of whom finished school some years ago, had never heard of countertrade explosion in reciprocal trade. They either lost lucrative sales through refusal to engage in the mysterious practice of countertrade, or signed a countertrade contract first and then discovered that they needed some sort of strategy. Managers who would never hear of putting the company into a new market without extensive research and strategy formulation innocently put the company unprepared into a whole new trading environment. They had to stumble through their early countertrade transactions--learning on the job by trial and error. It is not surprising then, that many U.S. companies have no specific policy or strategy concerning countertrade. Some deliberately downplay countertrade, feeling that it is only a small part of their international operations and thus is not worth the trouble of special policy and strategy formulation. Others are interested in countertrade, perhaps even enthusiastic about its possibilities as a marketing tool, but have not been able to develop an effective strategy due to inexperience, confusion, intercompany conflict, or lack of intercompany coordination. The basic policies and strategies outlined here represent and attempt to classify and compare the countertrade practices of selected American companies, and might be used by other companies to evaluate their own countertrade practices. Frameworks for strategy formulation and the strategic process in countertrade are also provided. The terms "policy" and "strategy" are often used interchangeably, although distinctions can be made between the two terms. Countertrade policy is defined here as the company's attitude toward countertrade. While countertrade strategy is defined as the approach the company takes to countertrade planning and transactions. There are two basic types of countertrade policies: company advantage and mutual advantage. Under a company advantage policy, countertrade/offset is used primarily for the company's benefit (to make a sale, to maintain market share, etc. ), with the needs of the buyer country being met at the minimum possible levels. Most companies follow this policy. The effectiveness of the company advantage policy varies. At best, it results in a satisfactory arrangement for both seller and buyer. At worst, it can be a disaster; companies may try to get out of their obligations once the sales contract is signed--on the theory that it will be easier to pay the penalty than carry out the offset--and then get into a lot of trouble with the buyer country. In contrast, companies with a mutual advantage policy give the needs of the buyer country equal weight with their own. Under this policy, the company is concerned with the goals of the buyer country (i.e., modernization, industrialization, balancing trade, increasing living standards, etc. ), and how the countertrade transaction will help achieve these goals. These companies are willing to meet the challenge of achieving mutual benefit through countertrade, and in most cases their efforts are successful. The choice of a countertrade policy may be an early and deliberate decision on the part of the company president. More often, however, the policy evolves slowly, growing out of the company's experiences in trading with different companies. If the company trades with "good" countries--those in which the state trading officials are well-intentioned, straight forward, and efficient in carrying out their side of the deal--it will probably develop a mutual advantage policy. There are also some cases in which the company begins to follow a mutual advantage policy in a particular country because of a foreign-born executive's loyalty to that country, and then expands the policy to include trade with other counties. Companies which have countertraded with "problem" countries usually hate countertrade; depending on how difficult their experiences are, they will either approach countertrade with extreme caution or wish it would disappear. If the company has encountered corrupt foreign officials, slow delivery or non-delivery of counterpurchase products, poor quality products, sudden changes in product availability, demands for the moon (secret product formulas, proprietary technology, etc.) or other aggravations, it can hardly be blamed for following a company advantage policy. On the other hand, some companies whose countertrade transactions run relatively smoothly still resent having to countertrade. This resentment may be due to something concrete, such as lowered profits, or to something intangible, such as a belief in the pure forms of free trade and fair competition. Sometimes the company is simply new to countertrade, and wants to move cautiously until it builds up expertise. Countertrade policies may change over time, due to many factors. These include changes in corporate leadership, the weight of accumulated countertrade experiences, profit levels, and the overall international trade and financial environment. Generally the policy moves from the lower form of company advantage to the higher form of mutual advantage, although sometimes a singularly bad countertrade experience can push the policy backward to the lower form. A policy normally evolves out of a company's experiences in trading...moving from a lower form (of company advantage) to a higher form. Dual policies may exist within the same company, with some divisions believing in company advantage and others in mutual advantages. This situation reflects ambivalent leadership. Some companies are in a state of flux concerning countertrade policy. For these reasons, the policies of individual companies are somewhat difficult to identify, but they can be roughly classified. The following examples of the two policies given reflect the author's observations of companies' countertrade activities rather than policy statements of the companies themselves. Cyrus Eaton Co. and Armand Hammer's Occidental Petroleum Corp. are classic examples of companies with mutual advantage policies. Both companies have been trading and countertrading with socialist countries since the 1950s. Each company has exceeded $50bn in trade and investment. They are heavily involved in infrastructure projects for economic development and modernization. These projects include agriculture and dairy technology, mining and chemicals, energy and transport, and high technology. Cyrus Eaton and Armand Hammer have been powerful positive forces in the promotion of East-West trade. Coca-Cola Co. operates under a mutual advantage policy through Coca-Cola Trading Co. In most countries, Coca-Cola goes much further than simply selling syrup and taking back local products; the company transfers food and beverage technology and assists in developing foreign marketing programs. Most of these programs are designed to help the countries penetrate the American market. For example Coca-Cola assisted Yugoslavia and Romania in the production of wine for the American market, advising them on American taste in wines and appropriate package designs, as well as making agreements with American wine distributors. In Turkey, Coca-Cola set up a joint venture to produce tomato paste for the American market and other markets, providing management and technology for the plant. Coca-Cola generally tries to set up a partnership with customer countries. Avon, Colt Industries, and Grumman International are examples of companies following a company advantage policy. Avon uses countertrade to release blocked funds; they build plants in various countries and export part of the production in order to generate hard currency. Avon products made in developing countries are exported to other developing countries, rather than to industrial countries. (Unlike most products, 80% of the cost of cosmetics is promotion; thus there is no cost advantage in making cosmetics in low-wage countries for export to industrial markets. Avon does not accept counterpurchase products. Colt's defence divisions do a small amount of countertrade in order to compete with foreign defence firms. They usually limit their countertrade obligations to sourcing or counterpurchase; they do not buy back or export products related to the original sale. Counterpurchases are liquidated through trading companies. The defense divisions of Grumman handle substantial amounts of countertrade. Their countertrade methods include sourcing, counterpurchase, and subcontracting. Grumman uses trading companies to liquidate indirect offset obligations. Boeing and McDonnell Douglas are examples of companies with dual countertrade policies; their military and commercial divisions each follow different policies. Boeing Commercial Aircraft Co. follows the company advantage policy. In the sale of the 747 and other civilian transport aircraft, they will accept only minimal countertrade obligations, and will then liquidate these obligations through outside trading companies. In some cases, they will handle direct offset such as aircraft maintenance facilities. Boeing's defense divisions operate under the mutual advantage policy, however; as illustrated by programs like the Peace Shield offset with Saudi Arabia in which Boeing is helping the Saudis develop a number of high-technology projects. In contrast to Boeing, the commercial company of McDonnell Douglas follows the mutual advantage policy, while the military follows the company advantage policy. Douglas Co. was one of the first companies to market civilian aircraft through countertrade. They emphasize export development in buyer countries, helping the countries market nontraditional as well as traditional exports. A recent large project is the offset with China for the sale of MD-82 jetliners. The offset includes subcontracting of components to the Shanghai Aviation International Corp., manufacture of landing gear doors in China, technical training, and participation of Chinese engineers in the design of new generation McDonnell Douglas aircraft. The military aircraft company, McDonnell Co., has a small countertrade staff to fulfill direct offset obligations, and liquidates other obligations though a New York trading company which it helped to establish. The countertrade strategies of American companies may be divided into four general types, defensive, passive, reactive, and proactive. Defensive, passive, and reactive strategies correspond to the company advantage policy, while proactive strategy is derived from the mutual advantage policy. Again, the following identification of strategies for individual companies is based on the author's observations. CT policy is a company's attitude toward countertrade. CT strategy is the approach the company takes to countertrade planning and transactions. Defensive. Companies with a defensive countertrade strategy ostensibly do not countertrade at all; however, they make many countertrade-type arrangements with buyer countries. These companies will avoid any contractual countertrade obligations, but they make it clear to the country that they will reciprocate in some way for the sale. Some companies will sell their products at rock-bottom prices and promise to help the country with export development. Others participate in barter deals by having an intermediary like an independent trader take title to the goods on each side, therefore making the transaction appear to be conventional import and export rather than a swap. No matter what kind of deal is made, however, these companies will insist that they do not countertrade. They seldom have in-house trade units. A variation of the defensive strategy is that of companies that say they do not countertrade, although they do it openly and regularly with Eastern European countries and China. They seem to think that this trade does not count, offering the excuse that "it's the only way to do business in socialist countries." They may also be defining countertrade as practice restricted to developing countries. Incidentally, most industrial country governments that practice military offset among themselves follow a defensive countertrade strategy. The beneficiary countries call their requirements "industrial benefits" and swear that they are against countertrade; the partner countries go along with this by refusing to include military offset in the definition of countertrade. Examples of companies following a defensive countertrade strategy are Bell Helicopter, Textron, EBASCO, Gould, and Borden. Passive. Companies with passive countertrade strategies regard countertrade as a necessary evil. They participate in countertrade at minimal level, on an ad hoc basis. Some companies operate this way because they have product leverage (i.e., little or no competition), while others follow the passive strategy because of disinterest in countertrade. Companies with a passive CT strategy regard it as a necessary evil, and participate at a minimal level on an ad hoc basis. These companies will accept contractual offset and countertrade obligations, but only on their own terms. They will rarely obligate themselves to export development or indirect offsets such as counterpurchases. However, they will use countertrade for sourcing, which is a form of export development. Passive strategy companies regard countertrade primarily as a form of export financing. They will not initiate countertrade or offer it as a sales incentive; rather, they will wait until the buyer country requests countertrade. Some of these companies have small in-house countertrade units. Most chemical companies and manufacturers of chemical products have passive countertrade strategies. These include DuPont, Dow Chemical, Cyanamid, Smith-Kline, and the chemical divisions of Amaco and the Ethyl Corp. Some of the defense companies with product leverage also have passive strategies, including Lockheed-Georgia, Martin Marietta Aerospace, Texas Instruments, Sperry Corp., and Singer Co. Other companies using passive countertrade strategies are Alcoa, Polaroid, S.C. Johnson & Sons, and Nabisco. Reactive. This is the most common strategy among American companies. Companies with reacting strategies will cooperate with the buyer country in offset/countertrade requirements, they use countertrade strictly as a competitive tool, on the theory that they cannot make the sale unless they agree to countertrade. Although they may consider countertrade as a permanent feature of their international operations, they do not see it as a marketing tool for expansion. Reactive companies often have large in-house countertrade units, and use outside trading companies when necessary. They rarely have in-house world trading companies. Most American companies have a reactive strategy toward CT, using it strictly as a competitive tool on the theory that they cannot make the sale unless they agree to CT. Most defense companies have reactive strategies. Among these are the defense divisions of Litton, Grumman International, Garrett, BMY, TRW, Perkin-Elmer, Emerson Electric, General Dynamics, Northrop, Allied Signal, McDonnell, Motorola, ITT, Raytheon, and LTV Aerospace and Defense Co. Non-defence companies with reactive countertrade strategies include Kodak, Xerox, Dresser Industries, Chrysler, Burroughs, and IBM. Proactive. Companies with proactive strategies have made a commitment to countertrade. They use countertrade aggressively as a marketing tool, and are interested in making trading an active and profitable part of their business. They regard offset and counterpurchase as an opportunity to make money through trading, rather than as an inconvenience. Companies with proactive strategies have made a commitmemt to CT. They use it aggressively as a marketing tool...regard its use as an opportunity to make money through trading rather than as an inconvenience. Proactive companies participate in all kinds of countertrade, including global sourcing, releasing of blocked funds, trade development, and trade financing. They often have in-house world trading companies, and will sometimes liquidate countertrade obligations for other companies. Examples of companies with proactive countertrade strategies include Cyrus Eaton, Occidental Petroleum, Continental Grain, Caterpillar, Monsanto, General Foods, Goodyear, Rockwell, General Electric, FMC, Westinghouse, Tenneco, 3M, General Motors, Ford, Coca-Cola, United Technologies, Pepsi-Cola, and the civilian product divisions of McDonnell and Lockheed. A company's strategy should be guided by the policy it has formulated to achieve its goals. Unfortunately, the guidelines derived from company policy are not always specific. This can result in either the wrong strategy, or multiple and conflicting strategies within one company. When a company has an ambiguous countertrade policy, the divisions are left to interpret the policy as they see fit, and they will develop strategies on a trial and error basis. Sometimes one division will take the initiative in countertrade/offset; the manager of that division becomes the company countertrade expert by default, and other divisions will follow his strategy. This at least results in a consistent strategy, even if it happens to be the wrong one. In other cases, the divisions handle countertrade independently, with each division following its own strategies or adopting various contingency strategies. The entire company's countertrade related sales performance suffers because of a lack of coordination and teamwork. The first step the company must take in developing a countertrade strategy is to define its policy clearly to its divisions. It should then make periodic reviews and evaluations to ensure that the strategy being used is consistent with the policy. However, the divisions should have the flexibility to use contingency strategies, as long as these strategies are within the framework of company policy. Finally, it is important that the divisions coordinate their countertrade operations, in order to minimize conflict and improve cost effectiveness. The countertrade policies discussed here are mutual advantage and company advantage and, as noted earlier, proactive strategy is usually associated with the mutual advantage policy, while the defensive, passive, and reactive strategies fit the company advantage policy. In rare cases, however, proactive strategy may be used by a company following the company advantage policy. The mutual advantage countertrade policy is the appropriate policy for socially responsible multinational corporations. Multinationals are expected to contribute to the economic development of developing countries through the transfer of management, marketing, finance, and technology. Countertrade is part of this effort, and is treated as a developmental activity. In industrial countries, multinational corporations are expected to provide technology and employment. Many U.S. corporations agree with this policy in theory, but cannot afford to follow it. American business is geared to short-term profit because of the st ructure of financial markets. Only the largest corporations can afford to undertake socially responsible projects; such projects are usually oriented to long-term profit. Large-scale countertrade operations involving economic and trade development usually fall into this category. Under the proactive strategy of a company following a mutual advantage policy the major task is to design a countertrade/offset project that will be profitable for both parties. The objective is to get continued and expanded business in the country (market growth) through the establishment of a long-term relationship, even if it means losing money for the first few years. Companies following a company advantage policy are more entrepreneurial and opportunistic than socially responsible. They are usually profit maximizers. The most effective strategy under a company advantage policy is the reactive strategy. The major objective of the reactive strategy is to make the sale through cooperation with the buyer country. The goal is not so much long-term business as it is satisfaction of the buyer country in a particular countertrade/offset deal. The objective of the passive strategy is either sourcing or export financing; cooperative arrangements with the buyer country are not very important. The least effective strategy is the defensive strategy. Companies using this strategy are the "sneaky countertraders," they want the benefits of countertrade (making the sale, export financing, etc.) without the responsibility of contractual, countertrade operations. This is a short-term strategy. In the context of countertrade, synergy means the benefits accruing to the company from the cooperative activities of the countertrade unit and the divisions. The choice of strategy directly effects the level of synergy, as well as the financial position of the countertrade unit. Figure 1 shows a matrix in which countertrade strategies are classified by levels of synergy and cost-benefits of the countertrade unit to the company. The nine cells position three of the four basic strategies-- proactive, reactive, and passive--according to their relative proportions of costs and benefits. The defensive strategy is not included in the matrix because companies using that strategy usually do not have a countertrade unit. The optimum position in the matrix is cell 1.1., which represents the maximum in synergy and benefits. The lowest position is cell 3.3., where synergy is low and costs are high. The median position is 2.2., where synergy is median and costs are at break-even. Some companies may find that their strategy does not correspond with one particular cell because of the varying practices of the divisions, each of which may have its own countertrade offices and strategies. Many companies do not have a clear strategic process for countertrade/offset bids and transactions, although they may have a well-defined overall strategy such as reactive or proactive. The strategic process in countertrade is not directly related to the type of strategy used; rather, it is a series of steps that companies should follow in countertrade operations, as illustrated in Figure 2. The first step is to analyze the countertrade/offset needs of both the company and the buyer country. The company's needs may include entering a new market, maintaining market share, or releasing blocked funds. Some typical needs of buyer countries are industrial development, export development, import substitution employment, and the generation of foreign exchange. In analyzing these factors, the company must decide how it can match its needs with those of the buyer country. When the countertrade needs and cost-benefits have been analyzed, the company is ready to prepare its sales bid and accompanying countertrade proposal. (Some portions of the countertrade cost is usually factored into the sales bid; although this practice is routinely prohibited by buyer country governments, it is necessary.) After the proposals are submitted, the company enters into negotiations with the buyer country. In some countries, the countertrade regulations may specify such things as additionality (exports above the usual level), specific markets for exports, or prohibition of the use of third-party traders. These points must also be negotiated, if the company feels unable to carry out the proposed obligations under specific restrictions. The contracts are signed when the negotiations are completed: one for the sale and one for the countertrade. In sales implementation, the company should adhere to the promised delivery schedules. In the implementation of the countertrade/offset obligation -- which may include counterpurchase, buyback, technology transfer, joint ventures or sourcing--the company should make periodic progress reports to the buyer country. Throughout the countertrade implementation period, the company should make periodic cost-benefits evaluations. An authorized agency of the buyer country will issue a certification when the countertrade obligations have been fulfilled. At this point, the company should do a cost-benefit analysis. The analysis should be used as guide for improving future countertrade transactions. By: Neil K. Rutter, President, Excom, Inc.
One of the unique risks of countertrade transactions is that companies often find themselves handling products with which they are not familiar. This is probably the greatest risk in a countertrade transaction. If you acquire title to the product (and even if you do not acquire title under certain circumstances) and the product causes damage to third parties, fails to meet the standards normally expected for the product, or fails to meet the warranties and/or guarantees for the product being sold, you can find yourself liable to third parties...including your customers and independent third parties. The greatest risk in a countertrade transaction is having to handle a product you're not familiar with. As a manufacturer of a mechanical product or a supplier of technology, to find yourself the seller of medical equipment, consumer goods, raw materials, et cetera, for which there is a legal claim can be a very disturbing and expensive learning lesson. The first suggestion for managing the risk is do not take title to the product; this should be obvious advice. One suggestion is to use a trader or other intermediary who can be responsible for the potential liability. Either they can ensure that the product does meet the requirements of the market or the contract, or they can better deal with the failure by substituting alternate product, or dealing with the claim or lawsuit. Another option is to use an in-house trading company, which is discussed below. You could act as a broker for the transaction, thereby avoiding taking title. If you must take title you can protect yourself in several ways. The obvious solution is to have insurance to cover the risk; this can be expensive especially if this is not your normal product. You can attempt to ensure that your contract of purchase provides that the seller indemnifies you in the event that you receive a claim or are sued. This will be of limited value when your seller is from a developing country and is not very rich, does not carry insurance, is difficult to sue, or has not provided security or guarantees. You can always attempt to get your supplier to provide insurance coverage or guarantees for this liability, and in certain circumstances this is a good solution. Clearly the drafting of the indemnity clause and the clause requiring insurance must be carefully done. You could always attempt to contract away your liability in your contract of resale with the ultimate buyer, but this will not protect you in all circumstances, especially where there is damage to third parties. In many jurisdictions it is impossible to contract away liability for this damage. One solution is to establish an in-house trading company which is a subsidiary of the primary manufacturing or engineering company requiring the countertrade. If properly established and maintained, corporate protection may be afforded by the use of a subsidiary corporation. If properly established and maintained, corporate protection may be afforded by the use of a subsidiary corporation. There are many factors which a court will take into consideration when deciding to "pierce or lift the corporate veil." In order to avoid this happening, corporations should consider some of the following: incorporate the trading subsidiary offshore in a country with favorable laws; joint venture with other companies, such as traders; ensure that management is not completely subservient to the corporate parent; capitalize the trading company with sufficient capital; operate it from a separate location; do not pay employees with the same checks as the parent corporation's employees; and select a law for your contracts which is most favorable to protecting the corporate identity. Also, if the subsidiary trading company acts independently and honestly it will more likely be protected. You need to ensure that the corporate records and the requirements for corporate existence are maintained. For example, shareholders' and directors' meetings must be held and recorded. Preferably some directors should not be corporate employees. There are other factors which any lawyer can easily describe to you. Although the use of a captive or in-house trading company can be helpful to minimize liability, many large corporations fail to properly carry out this exercise. Usually they set up a trading subsidiary, and then run it like any other division, thereby negating the effort. A unique problem for countertrade transactions is that its problems will interfere with the sales contract (i.e. the sale of your product, versus the countertrade transaction). The countertrade transaction is designed to support your sales contract, and yet could actually end up interfering with your main sales contract. In the event that there are problems with the countertrade transaction and the supplier of the goods has a claim against your company (or your trader), it is obviously not in your company's interest that your countertrade partner (or buyer of your industrial goods or services) interfere with the contract of sale. This interference could include seizing money which was to be used to pay for the goods or services your company sold, claims upon guarantees or bonds issued for performance under the main sales contract, or interference with the import of your original goods. The traditional method of handling this risk is to clearly separate the two contracts without a direct link between the two, other than necessary references for clarity. Failed performance under one contract should not impact the other contract. Careful drafting may be required to ensure that the two are separated. In some legal systems it is more difficult to do this, and European civil law systems will tend to review the entire transaction, and are more likely to allow interference between the two contracts, but the English common law systems are less likely to allow this interplay. This is a good reason to ensure that you have a good choice of law clause. The use of an in-house trading company can help separate the two contracts; the sales contract would be signed by the company responsible for selling your product and the countertrade contract by the trading subsidiary. There are really two main currency risks. The first is non-convertibility, i.e. the currency will not be convertible when received or required. As many countertrade transactions are designed to avoid this problem, this is less of a risk than might be expected. The second risk is that the currency will have fluctuated in value, and that you will receive fewer dollars than you expected. The risk of non-convertibility through government action can probably be covered by political risk insurance. Alternatively, you could get a government guarantee that you will be allowed to convert currency as required. Of course this may not be much of a guarantee if the government changes its mind or a new government is in place, but it also might be insurable. Currency fluctuations are often capable of being protected by currency hedging contracts. These are possible on all hard currencies and on many soft currencies through specialist traders. Another way of protecting oneself is to have the pricing based on a currency that can either be hedged or that you can use. For example, if the payment of a countertrade export is in a soft currency, you could price it in Deutschemarks, which is capable of a hedging contract, or you could price it in US dollars. By using this arrangement you will receive sufficient soft currency to purchase the currency which your hedge contract is in, or to purchase the currency you require. You should ensure that the pricing is at a realistic level such that you will obtain sufficient soft currency to purchase hard currency at market rates. If there is a government or artificial rate and a more expensive gray or black market rate, then receiving sufficient soft currency to purchase hard currency at the real rate is very important. Also, you must have the ability and/or right to use this currency to purchase hard currency. Many countertrade transactions are longer term contracts, and the price of a countertrade product may vary substantially on the world market over the term of the contract. Industrial companies are not used to dealing with the volatility and unique pricing structure of many goods and commodities which are used in countertrade, and their inexperience can often cause difficulties for their companies. If you have fixed the price of the product you could find yourself with substantial losses or an inability to sell the product. An additional risk is that the product varies in quality as it is delivered. While this is not really a pricing risk but rather an issue concerning quality, it can be dealt with as a pricing risk, as the solution is similar. Understanding pricing or costs based on the use of standard trade terminology is an additional problem. For example, if you purchase goods on an FOB basis and sell on a CIF basis, you will be in for a very expensive surprise. There are a multitude of varieties of selling terminology. The obvious solution for price variation is to have a price based on the world market price for the product being purchased or traded. This can often be done by relationship to a published price, such as the LME price for aluminum and other metals, or can be based on prices published by trade journals, or list prices of other producers or users. Of course, these prices may be used as a base price only, and the buying/selling price can be a variable price on a formula basis. Alternatively the price can be fixed by relationship to componentsin the production of the countertrade product. The price could also be fixed by means of inflationary indices if appropriate. If the product is likely to vary in quality (and/or quantity if this has an effect on the pricing), then this should be reflected in the pricing formula. As for risks in using trade terminology, the best solution is either to use a trader or adviser who is familiar with the terminology, or to carefully check to make sure that you know what you are agreeing to. There are standard definitions for trade terms and you should ensure that both parties are using the same definitions. If necessary, define the requirements in your contract. A good starting point for defining trade terms is INCOTERMS, published by the International Chamber of Commerce in Paris. It is published and revised periodically. This is obviously the most common risk in any transaction. This risk may be higher in countertrade transactions, as you are probably dealing with less developed countries and less sophisticated sellers. Non-performance can take many forms, including complete failure to deliver, late delivery, partial delivery, or delivery of damaged, defective, or out-of-specification product. The effect of non-performance will be different under different contracts, and depends on the nature of the non-performance. It can render the sale of your product impossible, and/or failure could leave your company open to claims or lawsuits from unhappy buyers. 1) Make reasonable contracts. The most effective manner is to ensure that the transaction works. The surest arrangement is to deal with competent and experienced partners. But, as we are all aware, this may be extremely difficult in countertrade transactions, especially in developing countries and in countries which are changing from a centrally planned economy to a free market economy. A good solution is to make contracts which you are comfortable that the other party can meet. There is no point in forcing another party to accept a contract which you are convinced that they cannot fulfill. 2) Use traders. Another solution is to use other parties that are experienced in the country and/or product to handle the import/export of the products. In other words, use an experienced trader. 3) Use insurance. You may be able to insure the risk under certain circumstances. Political risk insurance has far broader coverage application than you might expect. It is available to cover the failure of the seller for almost any reason, not just failure to perform because of government action. The insurance is generally available only for sales by government-owned enterprises, although other similar coverages may be available. 4) Get guarantees. If you cannot ensure that performance will occur, you should protect yourself from the effects of failure, as much as possible. In general, some form of guarantee of performance is usually prudent, these guarantees can include standby letters of credit, performance bonds, bank guarantees, cash deposited in an escrow account, product delivered to a neutral party, or government guarantees, etc. These do not ensure performance, but rather provide security that you will recover something in the event of the other party's failure to perform. Each of these has advantages and disadvantages. A standby letter of credit is excellent security, especially if properly drafted, as financial recovery is basically immediate. The letter of credit is a separate contract between the bank and the beneficiary (you) and is not subject to any of the rights or defenses available under the sales contract. Banks are obligated to pay upon presentation of the required documentation, often merely being a simpledemand letter. However, many companies cannot provide such security as they will likely be required to deposit the entire amount with the bank. Also, a standby L/C from some banks will not be worth very much, especially if it cannot be confirmed, insured, or discounted. A performance bond is really a contract of insurance, and therefore provides some security. But recovery may be time-consuming, plus the insurer has the same rights and defenses as the insured party. A bank guarantee is very similar to a standby letter of credit, but the bank has the right to use the same defenses as you would be entitled to use. A bank guarantee, in a sense, is somewhat like a performance bond and a standby letter of credit, but very few banks will issue such documents, other than in a form which really will operate as a standby letter of credit. The bank, unlike an insurance company, is not interested in reviewing the transaction and ascertaining why it failed; rather the bank wants to deal with documents only. A payment into an escrow account basically provides the same security as a standby letter of credit, depending upon the working of the trust agreement. This is a costly method of providing security and your partner will probably resist the option. Sometimes, however, the supplier will agree to deliver product and agree that the proceeds of sale may be held as security. Deposit of product with a third party may be a more attractive option for your partner as this does not appear to him to be a deposit of money. Of course there are issues as to location, control, cost of storage, release of the product, etc. At times this is a useful solution, especially when using aluminum or other products which can be stored in LME warehouses and are easily convertible to cash. A government guarantee does not provide security, but may allow you to insure non-performance through political risk insurance. If you are dealing with an entity which is not insurable through political risk insurance, you may be able to obtain insurance on the government guarantee although not on the contract itself. Sometimes non-performance is due to events beyond the control of the party in default. These are generally referred to as events of "force majeure," which means a "major force." This is a legal concept meaning that the contract cannot be performed because of a superior intervening force outside of the control of either party. Certain events are generally recognized as events of force majeure by all legal systems, however, others may depend on the law of the contract. Other events of force majeure may be specifically described in the individual contracts. Events of force majeure generally delay the performance of the contract until the event preventing performance has ended. Force majeure, in its purest sense, are those events which are always recognized as events of force majeure. These can arise from several causes, the two most common being either "acts of God"/"acts of nature," or acts of government. Common events of force majeure under the former include floods, fire, earthquakes, hurricanes, severe winds and other acts not attributable to man in general. Acts of government which are generally considered events of force majeure include war, both civil and war involving several countries, insurrection, and acts preventing one side or both sides from performing under their contract, such as embargoes. However, licensing is not generally an event of force majeure, as one party or the other should be able to obtain a license. Events of force majeure must directly impact the parties preventing their performance, not merely making their performance more difficult or expensive. However, some legal systems are more forgiving than others. As an example of the limited nature of force majeure in some courts, the closing of the Suez Canal in 1957 by invasion of Egypt by France, England and Israel was not considered an event of force majeure (which affected shipping) to the English and American courts. Shippers which customarily used the cheaper route through the Canal and were then forced to use the more expensive route around Africa due to the Canal closing, were unable to claim that this was an event of force majeure, because the courts held that there were alternative methods of shipping, although more expensive. The risks of force majeure are that your partner/supplier will claim force majeure whenever he wishes to stop performance for any reason. As your supplier is likely to be in a country in which government and business are closely connected, the supplier will often claim that the government has prevented it from meeting the contract obligation. Obviously, any failure to comply can have a detrimental effect on the sale of your product and may leave you liable to your customers. Managing the risk. The best protection is probably insurance. As the risks are generally remote, by definition, and are the normal risks for insurance, this is the best method of handling this risk. Your insurance coverage will not be possible unless your force majeure clause is as limited as possible. And you should check with your insurer or broker to ensure that your clause is acceptable. The risks of force majeure are that your supplier will claim force majeure whenever he wishes to stop performance for any reason. In order to manage this risk you should contract specifically for those events of force majeure which you cannot ensure and/or those which you can contract out of with your buyers. In drafting your force majeure clause you should ensure that there is a provision which requires the party claiming force majeure to prove by an independent means that the event actually occurred. A second alternative is to ensure that your contracts have the same force majeure clauses as you have with your supplier. This is sometimes difficult to arrange given the expectations of your supplier and your customers/buyers. You should also ensure that the force majeure clause describes what effect the event of force majeure will have on your obligations. For example, you may wish that the party claiming force majeure should only be entitled to delay performance, or you may wish that the contract be cancelled totally after a certain period of time. Lawyers can be very flexible and creative in drafting these clauses. Caution should be exercised in using or defining certain events as events of force majeure, such as inability to perform because of labor disputes, unavailability of labor, raw materials, supplies, shipping, energy, etc. Of course, you may require these to be included to protect yourself. A good lawyer will not include these as events of force majeure, but rather will define these as "events preventing performance" or similar wording in order to keep force majeure as a relatively dramatic and limited event, and to ensure that it is insurable. Payment risk is not a common risk for the countertrade transaction, as you are purchasing, not selling product. However, if your barter transaction requires that a short-fall be paid in cash, there may be a payment risk. There is a credit worthiness issue if you are required to make a claim against the seller. While corporations are familiar with handling this risk in domestic transactions through credit analysis, this is not often possible in international transactions. While there are companies which can provide sophisticated credit analysis for many foreign companies, these are expensive. And the analysis is seldom available or reliable for third-world companies. Additionally, while litigation is fairly reliable in developed countries, it is often very unreliable in certain countries, and even international litigation between developed countries is costly and time-consuming. A party failing to pay because it is bankrupt or because it doesn't want to pay, for whatever reason, is an extremely difficult problem in an international transaction. Managing the risk. The traditional method is to use a letter of credit (L/C) from a reputable bank. If the (L/C) is not from a reliable bank, it can often be confirmed by a reliable bank. Or the L/C can be insured or discounted. A party failing to pay because it is bankrupt, or because it doesn't want to pay for whatever reason, is an extremely difficult problem in an international transaction. If you have many transactions it is possible to obtain volume discounts from certain parties through credit announcement enhancement. Other methods of handling this risk are to insist on security deposits, or to require guarantees from other parties working with the seller who are easily sued. L/Cs are important in barter transactions involving parallel L/Cs, and are also important to ensure payment on resale of the countertrade transaction. There are many articles dealing with L/Cs and therefore there is little need to spend much time with the subject here. As many industrial companies are not accustomed to international L/Cs, there may be risks attendant on using them for payment. They are very exact documents and require experience or training to properly ensure that this excellent method of payment actually works. There are many ways that skillful traders can avoid payment under L/Cs when they are badly drafted. Managing the risk. The best solution is to ensure that you receive advice on how to structure your L/C. Also, again, you may wish to use a trader familiar with the product and possibly the parties. Timing can be a risk in many ways. If your supplier fails to deliver in time, you may be liable to another party who was expecting to receive the product. Other timing risks impact on currency risks or payment risks. For example, if your L/C expires before delivery, you are not guaranteed payment. Or if your hedging expires before delivery, you may not receive the money you expected. Managing the risk. This risk should be generally managed in the same manner as non-performance. The risk of delay impacting on your hedging contracts or your L/Cs requires carefulmanagement of your countertrade contract. This is a good reason to use a trader, as they have experience with these problems, and also have systems and personnel to handle them. a) Dumping. This occurs when a seller sells a product into another market at prices less than the home market, or at prices less than its cost. Often it is more difficult to obtain the real price for the countertrade product than it is for traditional sales. The penalty for dumping is an "anti-dumping duty" which is chargeable to the importer of the product. Obviously this could have a detrimental effect on pricing and the countertrade transaction. Managing the risk. The safest method of handling dumping problems is to use a trader or to act as a broker and have another party import the product. If you must be involved, you should provide in your contract that any anti-dumping duties are for the account of the seller and should obtain security for this if it is a likely risk. The safest method of handling dumping problems is to use a trader or to act as a broker, and have another party import the product. The difficulty of ascertaining whether dumping is a risk is that dumping is an extremely complicated issue, and a complicated economic analysis is required which can be time-consuming. Also, since it is often difficult to ensure that it is done properly, it probably is not worth the effort for most industrial corporations. b) Quotas. These are agreed limits on the volume of product that can be imported into a country. For example, there might be an agreement between China and the USA in which only 20 million items of a textile product can be imported into the USA in any one year. If your countertrade transaction involved the import of the next 2 million items, you would not be allowed to import them. The transaction would therefore fail or be delayed until the quota opened again in the succeeding year. If you have already delivered your product to the Chinese importer, you might have to wait for some time. And this could have a negative impact on your profitability. One of the problems with the quota system is that the Customs Service in the importing country will simply refuse to allow additional product to land. It is difficult to obtain accurate information on what quantity has landed, and the situation can change very quickly if new product lands between your inquiry and your product's landing. Managing the risk. Quotas should also be left to the seller to obtain, as the responsibility for managing quotas rests with the exporting country. Alternatively, you could use a trader to avoid the risk. c) Embargoes. Certain countries, e.g. Iraq, are subject to embargo regulations, and any attempt to deal with products from these countries or to deal with companies/individuals from these countries may be a criminal offense. Certain countries are subject to embargo regulations, and any attempt to deal with products from these countries or to deal with companies/individuals from these countries, may be a criminal offense. Managing the risk. While you may know that you cannot deal with Iraq or other countries subject to embargo, you may not know, say, whether or not the company in Cyprus (which has offered you steel from Romania) is owned by a company in an embargoed country. It is often extremely difficult to ensure that you are not dealing with a restricted company. There is no easy solution to the problem, and checking the regulations to determine whether your partner/seller is subject to embargo is time consuming, and probably not reliable. d) Licensing. Failure to obtain a required license can mean that your product is not exportable from a selling country, or importable in a buying country. And this could obviously have an extremely negative impact on your countertrade transaction. It is standard risk in all international trade transactions, and there has been much litigation resulting from parties failing to obtain licenses and determining who had the obligation to obtain the license. Managing the risk. In order to avoid problems with licenses, the obligation of either of the parties to obtain the necessary licenses must be clearly agreed to in the contract. In order to avoid problems with licenses, the obligation of either of the parties to obtain the necessary licenses must be clearly agreed to in the contract. e) Sovereign immunity. This is not the result of government regulation, but is a legal doctrine which prevents lawsuits against foreign sovereigns. In other words, you cannot sue foreign governments. Unfortunately many foreign governments operate business or quasi-business operations, and sometimes these organizations are provided with sovereign immunity. If you deal with one of these entities and attempt to sue on a failed transaction, you will be prevented from doing so by most courts. Managing the risk. A simple and expedient solution to the problem is to ensure that the other party waives any defense of sovereign immunity. One of the major risks in international transactions involves the settlement of disputes. While it is relatively easy to sue a party in your own country, it becomes more difficult across international boundaries. And it is particularly difficult where the defendant/respondent is from a third-world country, where justice is less than fair and is never fast. The costs of either litigation or arbitration are extremely high, and wherever possible you should avoid them. A relatively simple arbitration proceeding can cost upwards of $150,000 to $200,000, and can easily take a year or more to complete. And this does not include the time and expense for attempting collection after the judgment or award. Management of these issues/risks. The safest solution is to avoid litigation/arbitration. Carefully structure your transaction so that it is unlikely to fail, and rely on other protections than courts or arbitrators, such as insurance or guarantees. However, if all else fails, you may need to resort to these measures. If you have failed to carefully draft your dispute resolution clause, you could find yourself in more difficulty than you expected. A dispute resolution clause should provide for either arbitration or litigation. The choice of litigation or arbitration is not a question of legal preferences, as there are differences between the two. Arbitration is generally faster and cheaper, can remain confidential, and in many circumstances it is easier to enforce an arbitration award in a foreign country than it is to enforce a court judgement. Litigation is very time consuming and costly, and if a jury trial is allowed (as it usually is) it can be very uncertain. However, litigation can allow for the best discovery of the other party's case, and has better pre-trial remedies. Although in many countries these are often also available in arbitration. Mediation is favored by many lawyers today, but it does not provide a firm award or judgment. And it is often merely a stepping stone to litigation/arbitration which can delay justice. A choice of law clause provides that the contract will be governed by one (or possibly more) systems of law. In international contracts it is usually very difficult to get the one party to agree to the other party's law, and usually a "neutral" law is chosen. As American law is a development of English "common law," a good second choice for American companies is often the law of another common law jurisdiction, such as England, Canada or Australia. Many other countries use a form of "civil law," including Continental Europe, Eastern Europe, Japan and China. Common law lawyers are less familiar with civil law concepts and vice versa. While there can be differences in the handling of specific problems, at the time of drafting the contract you may never know what the ultimate problem is likely to be. Therefore, the choice of law really is more often an issue of cost. If arbitration or litigation is necessary it is cheaper for your legal advisers to work with a law with which they are familiar. Otherwise you will need to hire an additional legal adviser or advisers. Obviously it is less expensive to use one set of lawyers, instead of two. A very minor point which can produce unexpected problems is the "execution" of contracts. Execution of a contract, to a lawyer, means the signing or other formal activity indicating acceptance of the contract. Certain jurisdictions require more formal execution of documents than others. And failure to execute properly a document may result in a court deciding that there was no contract. While this is unlikely where both parties have acted in understanding of a contract, nonetheless it is a small risk. Also some jurisdictions do not allow executions by telefax. Managing the risk. You should check with local counsel to ensure that the contract has been properly executed. If in doubt, have two senior officers sign under seal, and provide a corporate resolution empowering their signature for the contract. When executing a contract by telefax, ensure that you send a follow-up contract in hard copy and/or state that the parties have agreed that execution by telefax is legal and choose a law which allows such execution. Barter transactions provide additional risks and the certainty that some of the common risks of countertrade will have to be faced. A barter transaction involves a swap of products, without an exchange of currency; the transaction is only recorded in one contract, unlike the usual countertrade transaction. And thus difficulties in one part of the transaction will certainly impact on the other. Some of the additional risks or some of the unique attributes of barter transactions increasing the risk are described below. A barter transaction has a unique timing risk in that the party delivering first, under a pure barter transaction, is at risk that the other product will not be delivered. A barter transaction has a unique timing risk in that the party delivering first is at risk that the other product will not be delivered. Managing the risk. One solution is to swap the products at the same time, but this is seldom a realistic alternative. A second solution is to secure the barter through standby letters of credit, such that the party that fails to receive the product can recover under the L/C. A third and better solution is to have parallel letters of credit through the same bank. Recovery only occurs through shortfalls in delivery, whether expected or unexpected. The parallel L/C option works basically as two L/Cs, with documents submitted to the bank in a standard L/C fashion. The bank then calculates the amount owing to the seller, and offsets this amount by the products exported to the seller. As there is seldom an on-going relationship between the parties, there is a greater risk of quality problems and claims. To take an actual example, a barter involving an export of newsprint for processing equipment led to quality problems and claims. Possession of the processing equipment was required to ensure that the quality of the newsprint met world standards, and therefore early shipments were likely to be of poor quality. In fact the newsprint was defective and the countertrade transaction was soon in jeopardy. Quality problems caused the funds, which were to be used to finance the cost of the processing equipment, to be unavailable so the manufacturer refused to send the equipment. Also, the manufacturer of the processing equipment found itself involved in several claims, including shipping, insurance and quality claims from customers. And these are not easily handled by a manufacturing company unused to such claims. How could the manufacturing company have avoided these risks? Managing the risk. One method of handling the risk would be to place the proceeds of sale of the initially sold product into an escrow account, to be used to handle claims. Of course this creates difficulties for both parties to the transaction, and will delay the ability of the manufacturing company to sell and deliver quickly into the market. It also delays the buyer of the industrial product from acquiring the new equipment. A better solution would have been to use a trader familiar with the product in the first place, and better able to handle the resulting claims should they have arisen. Another solution could have been to use better insurance coverage. Also the initial preparation for the resale of the newsprint used L/Cs which were not carefully enough drafted to protect the industrial company. Better drafting of the L/Cs would have ensured payment and passed the risk on to another party. Unfortunately, as some of the sales were to U.S. corporations, the industrial company would have found itself involved in claims and/or litigation in any event. There is an additional pricing risk or issue in barter transactions. While in other countertrade transactions there is an agreed price for both goods, in a true barter transaction there is an independent evaluation of the price. For example, are two cats traded for one dog worth $5, $25, $100 or $500? Or are they worth half of a dog? If everything works smoothly there is no problem. But if the barter involved a transaction in which the cats were delivered first and the dog owner failed to deliver the dog, what are the damages for the former cat owner? Managing the risks. The obvious solution is to include a clause defining the value of the products being traded. If there were a dispute, the court or arbitrator could agree on a price for the dog or whatever else was to be traded. The use of parallel L/Cs would be an excellent solution to the problem. One of the major problems with countertrade transactions is that the products you will be allowed to export will directly impact your cost, your ability to complete within the time frame allowed, and possibly even whether you can complete the transaction at all. The impact of non-performance or delayed performance may be that your original sale will not take place, that you will pay more than you expected or budgeted for your countertrade, or that you will be subject to penalties or calls on your guarantees. Also, the products may expose you to greater potential liability on resale. Any of these problems could have a negative impact on your company. Managing the risks. As is often the case, you should engage experts who understand the country, as well as the products available and/or being offered. Experts who potentially have some leverage or previous connections in the country, to assist you in obtaining the best products. Your sales agent or local representative may be able to assist, as well as other exporters, traders or consultants who have had experience in the country. I also recommend that you agree with reliable third parties who will take the product from you in advance and at firm prices upon concluding your countertrade contract. To do otherwise is to invite greater costs, and greater likelihood of failure. Also, the use of third parties will minimize your liability on the resale of the product. Within many organizations, corporate policy requires that this obligation be totally taken over by a third-party specialist in countertrade or the product, with reliable guarantees that will protect the company in the event the third party fails to perform, which would put your company in a very unfavorable position for future sales. Another option is to carefully contract to ensure that you can legally fulfill your obligation by "bona fide" offers, which place the risk more firmly on the supplying country or the party obligated to supply product for your countertrade. In one such example involving my company, the cost to sub-contract the countertrade with traders would have made our bid unacceptable. And therefore we decided to undertake the countertrade on a legal "best efforts" basis, based on "bona fide' offers. countertrade credit for the offer. The credit was not 100% of the value of the offer, but rather a percentage based on various factors. While the local buyer of our product was not happy (nor were their central banking authorities), they recognized that we would honestly attempt to fulfill our obligation in order to remain a player in their market. Best-effort contracts in offset are more common when governments recognize that it really is a political "game." However, a counterpurchase arrangement which is designed to convert soft currency to hard currency, in order to repay an international loan, is somewhat more difficult. Structuring Countertrade Transactions. . . I have repeatedly suggested the use of third parties, especially traders. However, it is often difficult to obtain permission to use third parties, especially in offset contracts. And it is an issue which requires negotiation. If your contract does not allow you to use third parties you may be faced with accepting more risks than you might prefer, as you will be obligated to complete the transaction on your own. And possibly, depending on the wording, you may also have to take title to the countertrade product. The inability to openly use third parties can increase the complexity of the contract and therefore your costs. Also, if you take title, you are increasing your risk. Managing the risk. You should contract to allow the use of third parties, or at least not be prevented from using them. If the other party is reluctant, at least attempt to obtain approval to use related companies, suppliers, sub-contractors, joint-venture partners, consortium members, etc. This will provide you with more flexibility and ultimately will lower your cost and risk. Counterpurchase contracts often provide for penalties or guarantees of your performance. The effect of a penalty is fairly obvious, however in certain circumstances you could pay a penalty and still be obligated to complete your obligations. Guarantees of your performance are the flip side of guarantees provided by the other side. Performance bonds are usually cheaper than letters of credit, and are less likely to be used successfully by another party. Managing the risk. If a penalty is insisted on, clearly you should attempt to make it as small as possible and to provide that the penalty is in lieu of performance. You should also attempt to get a provision that allows for the return of the penalty if performance is ultimately completed. If the other party also insists on a guarantee of your performance or for payment of the penalty, you should attempt to provide the "most beneficial guarantee" that you can. The cheapest guarantee which is sometimes accepted is a simple corporate guarantee, which may be acceptable when the contracting party has a large corporate parent, and the party insisting is happy with the parent's guarantee. It is the cheapest and the least likely to be effective as your company controls the willingness to pay. The second best guarantee, if it is available, is a performance bond, which is really an insurance contract in which the insurer has the same rights as the insured, i.e. as you have. Therefore if there is a dispute, the insurance company will generally argue your case for you, and will not pay out until convinced it will lose or it is ordered to pay. Another possibility is a bank guarantee. While this is similar to a letter of credit, in theory, the bank is not obligated to pay if you have some legal argument which you might use to protect your position. In practice it is usually treated more like an L/C. The last guarantee is an L/C, which will be expensive and the bank's obligation is to pay out under its terms. It is extremely difficult to stop a bank paying out under an L/C, even if there is a legitimate dispute--the only possibility to stop payment is where there is obvious fraud. I strongly believe that the use of third parties, such as traders, can greatly diminish your risks and improve the likelihood of success. Traders understand their product and probably have a better relationship and understanding of the problems of the supplier/buyer of the countertrade product, as opposed to the sale of your product. However, you cannot simply turn your problem over to the trader, there are also risks attendant on contracting with traders. One of the reasons to use traders is to place the risk for many trading activities on a party that has more experience in the area than your company has. If your contract with the trader does not clearly mirror your countertrade contract, you could find that the trader has not accepted all the risks and you are left with some--probably the ones you do not want, such as the penalty! An example of poor contracting with a trader is as follows. A German company contracted with a trader, under a firm contract, for the trader to export product from a countertrade country at an agreed disagio. The German company then went back to complete negotiating their sales and countertrade arrangement. The negotiations went badly, and neither contract was completed with their buyer. In the meantime the trader had exported a substantial amount of countertrade product on their behalf, and claimed the disagio. The German company refused to pay, and was sued by the trader in German courts. It was held liable and ended up paying for the countertrade, which it did not require. Managing the risk. You must ensure through careful review, negotiations, and drafting of your contract with the trader that the risks are passed on to the trader, or that they have been identified and you have a strategy to handle those risks which are not passed on. In order to avoid timing problems with your trader you should contract very carefully. Ensure that your contract does not require payment until you have been given the credits by the local authorities, or you are legally satisfied that you have met your obligations. This can be problematic where the trader has an immediate export opportunity, and you do not have an opportunity to obtain confirmation that the exporter will qualify under your countertrade or offset contract. In these circumstances I have sometimes agreed to pay a lower fee with the remainder being paid on acceptance of the countertrade credit. Obviously, this is taking a risk which your company may not accept. If your trader is not a well known or reliable company, you will not likely be protected if the trader goes bankrupt or refuses to perform for some reason. Managing the risk. The safest route is to use a reliable trader. However, where this is impossible due to cost or other reason, you should ensure that you get guarantees from the trader or third parties that insure performance. These can include standby letters of credit, bank guarantees or performance bonds. You should at least ensure that the trader guarantees to pay the penalty if there is failed performance. There are other risks in using a trader. If your relationship with the trader is well known, you may not be isolated from risks such as product liability or liability for injuries to third parties arising from the sale of the countertraded product. You also cannot use a trader to avoid embargoes or other government regulations. A poorly chosen trader can ruin your relations with your customers or their governments by their different approach to business. Traders deal quickly and work on extremely low margins. The trading mentality is different from the mentality of a business executive in a manufacturing corporation. The trader is always out for maximum profit on each transaction, and this may conflict with your attempts to develop a long-term relationship with your client. Managing these risks and issues. Careful drafting may avoid legal liability issues including product liability and other government regulations, but your best protection is always to use a reliable trading partner. As for the difference in mentalities, this can be best handled by an intermediary, such as an in-house countertrade coordinator in either the industrial company or the trader, who understands the difference in approaches and mentalities, and can smooth over the relations. To avoid risks in countertrade, the best advice is to retain professional, experienced help. Generally this is a reliable trading company familiar with either the country or the product. Your own company is best able to handle the risks associated with its own products or services. The risks of countertrade can be considerable, both in designing and negotiating the countertrade contract, and in its execution. And the smartest and safest solution is to use experienced third parties. Editor's Note: This article was reprinted from Countertrade Review. John Holmes is the editor of this outstanding monthly newsletter of the Australian Countertrade Association, 31 Mawson Drive, Mawson, ACT 2607, Australia.